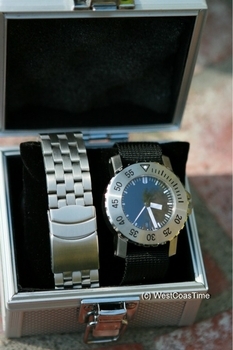 Offered is an incredible dive watch, manufactured in Germany and loaded with German engineering. This watch is available for a LIMITED time and very limited quantity. It is as tough as they come with its 5 mm thick anti-reflective coated sapphire crystal, thick steel case and heavy screw-on strap bars to make certain you… do not lose this watch ! For serious divers there is a working helium escape valve. But, you do not need to use this when you go to a business meeting or lunch where it will gain many admiring glances; this is not a common looking wristwatch. It screams: “I am here” - look at me! Once on your wrist it is handsome and heavy – but after an hour it is addictive, light and you won’t want to take it off - just keep looking back at it over and over again. Unlike most dive watches, this watch has a date aperture at 6:00 – which balances the dial nicely. Movement: Swiss Made ETA 2824-A2; automatic winding, "hacking" mechanism. 25 jewels with 40 hour power reserve and Incabloc shock protection. NOTE: the Rolex shown is NOT for sale and is NOT included in this offer, it is for size comparison only. Price is $1295.00 usd + $35 shipping via overnight delivery in the US and $50 worldwide express. Due to limited supply, this watch is offered on a first come, first served basis. Payment is due in full at time of order. PLEASE place your order via EMAIL ONLY and I shall email back your confirmation. You order will only be considered complete once payment has been received. There will be no pre-orders or reservations. Returns will only be accepted if watch has been unworn. Watch must be returned in as new condition with all enclosures and at the buyer's expense. Notification of desire to return must be made within 3 days of receipt of watch. Once notification has been made, and accepted, a pre-authorization will be given. WestCoastTime has been online in the watch business for 20 years. Watch is covered by a full one year warranty from WestCoastTime against defects of workmanship.